How to make money on mining: rental facilities or own ASIC? Home Blockchain How to make money on mining: rental facilities or own ASIC? Since the beginning of last year, mining is experiencing hard times — the Analytics company Diar, from January to March of 2018, income from mining cryptocurrency fell by 83%. But even if the bitcoin exchange rate to 3.7 thousand dollars in mining you can earn — figure out how to do it. Cryptocurrency market Analytics give different estimates of break-even point of bitcoin mining. DMG Blockchain Solutions believes that this value is at the level of 2.4 thousand dollars, experts Fundstrat see him in the area of 8 thousand dollars. Diar survey shows that some employers are willing to turn off equipment at the rate of 5 thousand dollars. Despite the serious drop in income, manners last year was able to earn 15.4 billion dollars — thanks to the emergence of new ASIC miners and other devices for mining cryptocurrency, and the ability to rent power equipment instead of buying. To purchase your own equipment or rent the power? This is one of the main issues for the miners during the most prolonged in the history of bitcoin bear market. In the case of services BitDeer, one of the largest platforms in the world of renting devices for calculations, and analysis equipment from Bitmain, Innosilicon, Whatsminer and Avalon try to understand which approach is more profitable. 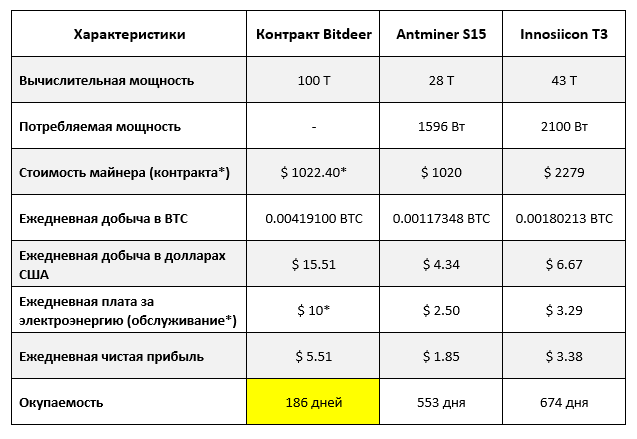 Calculate cost 1 teraherz purchasing an annual (360 days) of the contract capacity or BitDeer miners four manufacturers. 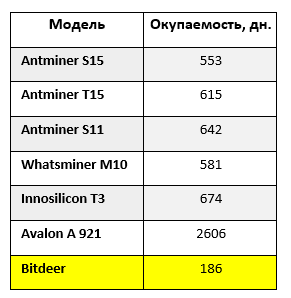 The table below shows that the price of 1 terahara have BitDeer at least 2.5 times lower than when mining on your own hardware. They quickly pay for themselves and contract to lease facilities for mining at BitDeer compared to the purchase of equipment for mining cryptocurrency. The rate at 360 days for 1022 dollar will be repaid in 168 days — then as the most favorable in this respect miner Antminer S15 only for 553 days. The ratio of the yield when renting capacity equal of 93.5%. Return on investment in mining for 168 days means that the rest of the contract is 192 days, the entrepreneur can only earn. This scenario is real, even if the bitcoin exchange rate to 3.7 thousand dollars. Have rental facilities there are two serious advantages over purchasing your own equipment. The first entrepreneur will no longer have to worry about the cost of repair. All depreciation expense is included in the tariff. In addition, mining the cryptocurrency at the exit of the equipment does not stop — BitDeer just takes the user to the backup equipment. The second advantage is the absence of difficulties in the selection and installation of equipment. BitDeer just ensures that the contracted capacity and all other issues handled by the engineers of the company. In January the English and Chinese language on the website BitDeer added Russian. This greatly simplifies the service and makes it convenient for Russian-speaking clients.